A week after reporting a power-line outage near where the Camp Fire is suspected of starting, Pacific Gas & Electric said in a regulatory filing that it suffered a second problem with a high voltage line the morning the devastating fire ignited. The utility company filed an incident report with the state California Public Utilities Commission Friday afternoon saying a high voltage line near the rural Concow area in Butte County suffered an outage at 6:45 a.m. on Thursday, Nov. 8. PG&E previously had informed the PUC of another high-voltage line outage a few miles away near Pulga that occurred at 6:15 a.m. that morning. That initial incident happened minutes before Cal Fire officials say they got the first reports of a wildfire in the Pulga area that would swoop through Paradise, Concow and Magalia later that day. 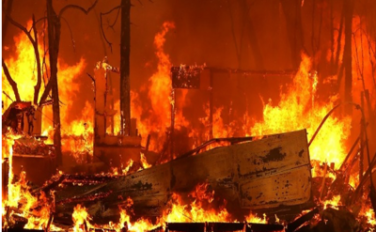 The Camp Fire, which is still burning, is now the deadliest in California state history, so far killing 79 people and destroying more than 15,000 buildings – the majority homes. Cal Fire officials said last week they are investigating two sites where the fire may have started, but have not released details of those investigations. They and PG&E officials have cautioned that there has been no determination yet of the cause of the fire. In its filings, though, PG&E acknowledged that firefighters were called to the scene of both outages, and have been looking into them. The second PG&E report was filed with state regulators at 4 p.m. on Friday, eight days after the incident occurred. In a federal Securities and Exchange Commission filing last week, PG&E acknowledged potential financial risks. “While the cause of the Camp Fire is still under investigation, if the Utility’s equipment is determined to be the cause, the Utility could be subject to significant liability in excess of insurance coverage that would be expected to have a material impact on PG&E Corporation’s and the Utility’s financial condition, results of operations, liquidity, and cash flows,” the filing read. PG&E has been hit with numerous lawsuits in the last year stemming from major wildfires believed to be caused by power line issues. Recently completed Cal Fire investigations have determined that 17 Northern California wildfires in 2017 were started by problems with PG&E power infrastructure. That pressure mounted last week with two new lawsuits involving the Camp Fire. On Friday, former Chico and Oroville police chief Kirk Trostle and his wife Patty Garrison, a retired school principal, sued PG&E, contending the utility company failed to take appropriate safety steps. The couple’s Paradise home was destroyed in the Camp Fire. A Bay Area attorney filed a similar suit against the utility on Tuesday on behalf of several other fire victims. Seeking to calm investor concerns about PG&E, California PUC chief Mike PIcker on Friday told The Bee he does not believe the utility is headed toward bankruptcy, despite the mounting threat of billions of dollars of legal liability from wildfires. The Utility Reform Network, a watchdog group, issued a public rebuke to the PUC and PG&E last week.